Max Pictures’ good friend and sometimes cameraman/sound engineer Kamen Rider recently celebrated a birthday. 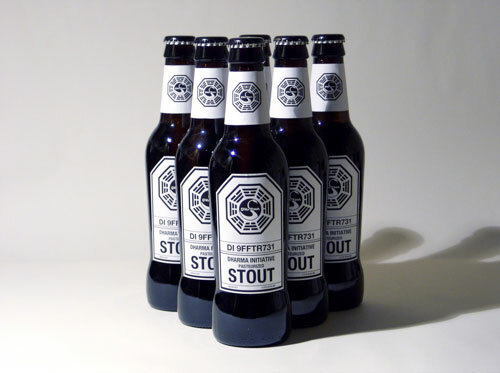 To honor his many years of service to humanity I set out on the not-so-easy task of making DHARMA Initiative beer labels. If you haven’t noticed, points 3 and 4 don’t quite jibe with each other. Therein lay my problem. In the end I settled on bottled GUINNESS® Draught. On the one hand it has this ‘rocket widget’ which is supposed to make it cascade every time the bottle is tipped (which is weird), and it comes in a uniquely-shaped bottle. On the other hand it had an easy-to-remove label, and I was running out of time for other options. I highly recommend printing the labels onto full-sheet self-adhesive label stock (Avery 5265 or equivalent). After carefully trimming and affixing the labels to the bottles, black out the harp logo on the caps with a paint marker or Sharpie. Chill for at least three hours and serve. Finally, because of the tapered shape of the bottle, the body label tends to pucker at the top. But, after drinking three or four you won’t care. Sláinte! This entry was posted on Thursday, April 19th, 2007 at 11:14 pm	and is filed under Food, Graphic Design. You can follow any responses to this entry through the RSS 2.0 feed. Responses are currently closed, but you can trackback from your own site.